This Moissanite Forever One station necklace features 7 handset moissanite 3.5mm stones, each having the DEW of 0.16ct. Station necklaces have been popular for years and will not be going out of style anytime soon. Give this as a birthday or anniversary gift to that special lady in your life. 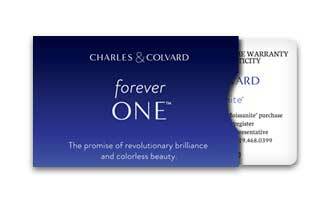 We source our Forever One moissanite stones from authorized Charles and Colvard distributors and each piece comes with a Lifetime Warranty card provided by Charles & Colvard.